I first reviewed Woojer three years ago when it was a matchbox-sized subwoofer that could be worn in a choice of ways -- in the center of your chest, the base of your spine, or against your hipbone or collarbone. Since then, the product has undergone a massive change, and is now a large, adjustable strap which you wear across your body (there’s also a vest version). Despite having changed form significantly, the idea behind Woojer remains the same -- which is to help you feel sound, not just hear it. Music at a concert is different to music played at home, or in the car, because the high acoustic energy that surrounds you means you don't just hear the sounds, you feel them. This is what Woojer aims to replicate. It works by taking some form of audio input -- be it music, or sound effects in a game -- and transforms this into a tactile vibration, which you can feel throughout your body. The Woojer Strap comes in a sizable, and high quality cardboard box. Inside this is the Strap itself, a Micro USB charging cable, male-to-male audio cable, carrying pouch, and the user manual. The Strap has two haptic units (Osci Actuators) positioned on either side, and the controls for it are located on one of these. 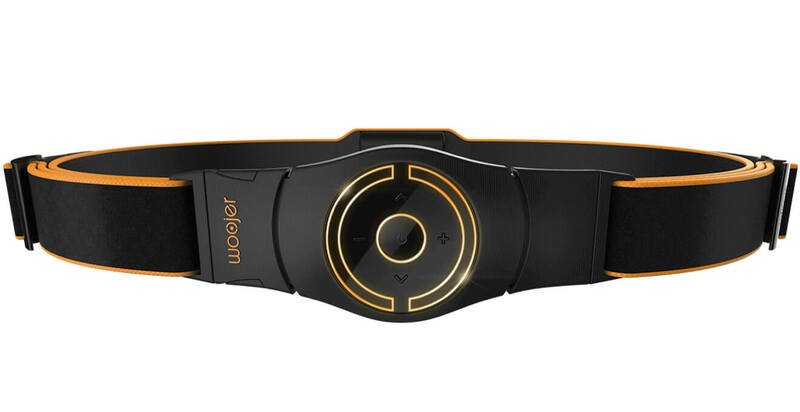 The button in the center turns the Strap and Bluetooth on, the up and down arrows let you control the strength of the sensation, and the plus and minus buttons control the sound volume. The same unit also has a Micro USB charging port, headphone socket, and audio input built in. Getting started is just a matter of enabling Bluetooth and pairing the Strap with your phone or other device. Depending on what you want to use the Strap for (just listening to music, watching a film, or playing a game) you can wear it around your waist, with the haptic units on the left and right sides of your body, or across your chest, with one unit at the front and the other on your back. You can also wear it like a beauty pageant sash if you prefer. Once your audio source is connected to the Strap, start something playing and immediately you’ll feel the vibrations. These can be quite subtle to begin with, but you can ramp them up as required until you get to the right level. The original Woojer (which was funded on Kickstarter) could be a little heavy and uncomfortable to wear, despite its diminutive size, but that’s not the case with the Strap. Once you’re wearing it you’ll hardly notice it, except when it’s pumping vibrations through your body of course. The Woojer Strap works best when you have music with a heavy bass tone, or loud effects. It’s excellent in FPS games like Battlefield 1 and Doom, where it really takes you into the action. When I tested Woojer last time one of the things I tried it with were audio-only mobile games like Papa Sangre II, and Audio Defence: Zombie Arena, and as I still have both of these on my phone I tried them again, for old time’s sake, and the Woojer didn’t disappoint, really helping to enhance the feeling of being there. The same is true of the handful of VR experiences I tried it with (IT -- Escape from Pennywise is particularity recommended. The Woojer Strap heightens the fright factor significantly). If you're into VR, then this is a definite must have. The optional Woojer audio app, available for iOS and Android, lets you customize your experience. You can specify the type of headphones you have -- EarBuds, On-Ear, or In-Ear -- pick an audio pre-set -- Classical, Electronic, Dance, Pop, Rock, R&B, Hip-Hop, or Flat -- and adjust the level. This goes anywhere from Hell No! to OMG!. The player also lets you pick your music, play, pause, skip tracks, and jump to any point in a song, and set your audio to repeat or shuffle. Woojer Strap certainly does add a new dimension to sound. It’s not cheap at $249, but that said, it’s currently on offer, and if you’re in the US you can pick it up for a much more reasonable $149.95, with free shipping. It’s available to buy here. The device is compatible with phones, tablets, PCs, games consoles, and VR headsets. Fully charged you can expect around 8 hours of use.